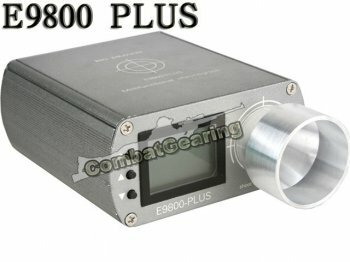 Thank you for using our product E9800 ¡VLCD. Please make sure to read this instruction carefully before you use it. Function: This instrument is specialized to test the firing speed of guns, the muzzle velocity, the firing kinetic energy and the shooting distance. A standard camera tripod can be installed to the instrument. Before the first use, please inset the original fitting DC8.5V external power source into the instrument, and charge for 8-10 hours on ¡§off¡¨ position to make sure the backup battery capacity to be sufficient. When it displays that the voltage of the built-in backup battery is lower than 4.8V, please use the external power source, and charge the backup battery after the use. While the charging is going normally, the red charging indicator light beside the electric outlet turns on. The longer it charges, the larger capacity the built-in battery will have, and the darker the indicator light becomes. The charging time can not be over 11 hours. Switch on: press Button¡´ for about 0.5 second, the instrument is switched on, and the screen displays as Figure 1 shows for Page1, now press Button¡´ again, the screen displays as Figure 2 shows for Page 2; the voltage of the battery can be displayed when press Button¡¶ at the stage of Page1 or Page 2 as figure 3 shows. Power off: press Button¡´ for about 1 second, the instrument is powered off. Page Figure 1 displays kinetic energy, the weight of the bullet, muzzle velocity, gun-firing speed per minute etc. Page Figure 2 displays kinetic energy per unit, caliber of the bullet, shooting distance, gun-firing speed per second etc. Page Figure 3 displays the voltage of the instrument¡¦s built-in rechargeable battery. When the voltage is lower than 4.5 V, the screen displays ¡§Low Voltage¡¨ to warn you and the instrument automatically powers off. Energy-saving automatic power off: if nothing is done to the instrument, within 30 minutes (can be set by yourself, the original set is 5 minutes), it will be power off automatically. Press button¡¿ to set the function list as Figure 3 shows, press button¡¿again to move the cursor. Item 1(AUTO POWER OFF) is to set the time of automatic power off. You can set nothing-is-done automatic power off for 1-30 minutes. Press button ¡´ then button ¡¶ to move the cursor to the time you want to set (shown in Figure 4). Press button ¡´ to choose, then press button ¡¿ to move the cursor to ¡§EXIT¡¨, and press button ¡´ to exit to the menu shown as Figure 3, then finally press button ¡¶ to the menu shown as Figure 1.